“The Assassin” is less a martial arts movie, than a contemplative costume drama, wonderfully photographed by cinematographer Ping Bin Lee (“In the Mood for Love”) and told at a leisurely pace by director Hsiao-Hsien Hou (“Flowers of Shanghai”). The movie won Hou Best Director at Cannes Film Festival as well as the Cannes Soundtrack award for Giong Lim. “The Assassin” is playing at the Pasadena Playhouse 7 and n Monterey Park. The first thing we see are two mules or donkeys, but these are not for Sister Sarah. These animals are for the white-robed nun, Princess Jiaxin (Fang-Yi Sheu) and her black-clad protege Nie Yinniang (Shu Qi). They watch for a man who poisoned his own father and killed his brother. “His guilt condemns him,” the nun declares as they watch a retinue of men on horses. The killing by Nie Yinniang is quick and the man is dead before his face can register fear or anger. The nun lives on what seems to be an impossible structure built at the side of cliff and the next time we see the eponymous assassin, she’s reporting to the nun. Yinniang has failed in her latest mission. The target was with his son and she was too tenderhearted to kill the man. Tian Ji’an is the governor of Weibo and had originally been betrothed to Yinniang. Although this was a political match, Yinniang showed Tian Ji’an some devotion, but ultimately she was sent away and he married another woman. Before sending the assassin off to Weibo, the movie cuts to Yinniang’s mother who plays the Chinese zither and recites the legend about the Kophen’s bluebird who for three years did not sing until the queen commented that bluebirds sing only for their own kind. When a mirror was placed before the bird, it sang sadly a beautiful song and it danced until it died. Of course, someone is the bluebird and just who? This exchange made as the women sit in front of a screen painted with the image of pine trees–symbols of longevity and self-discipline. Between the two women on a wooden table are red pomegranates that tell us we’re in autumn but also symbolize the hope of keeping rank within the same family. Nie Cheng will also mention the white peonies, symbols of beauty, rank and luxury, especially in connection to the Tang Imperial Court. The family name Nie means “whispers” and is represented by three symbols for ear. Yinniang means secret or hidden daughter. With any court there is plenty of intrigue and many whispers. People meet and almost meet between screens of trees and brush or billowing transparent fabrics. Historically, Weibo 魏博 was an area that is now part of the modern Hebei. During the Tang Dynasty, it was ruled by the Weibo Army under Tian Chengsi and under the Tian family, Weibo was one of the Hebei garrisons that revolted. So ultimately, we know that the endeavor to bring a lasting peace between Weibo and the Imperial court failed. Yet Hou’s movie celebrates the glory of the Tang Dynasty with its beautifully composed scenes between the court and all the political players as well as the quiet pastoral scenes. There are moments when we seem to see live-action freeze into a picture or break and come alive from off of a canvas. By going to Weibo, Yinniang is forced to see what might have been if she had married Tian Ji’an. He has children by his first wife (Yun Zhou). Yinniang makes it clear to Ji’an that she is there and what her mission is by watching his children and spying on him and his family. She leaves the jade bi to remind him of their former relationship and they meet in one-to-one combat where she refrains from killing him. Besides his family, Ji’an also has a consort, dancer Huji (Nikki Hsin-Ying Hsieh), who is pregnant, something she has tried to keep secret. Ji’an might love Huji too much for his head wife’s comfort. 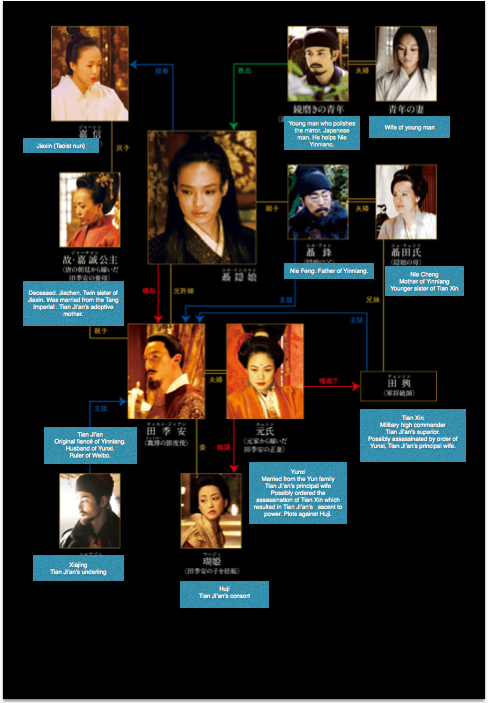 Ji’an himself wasn’t the child of Princess Jiacheng, but was adopted by her from one of his father’s consorts. Someone uses the Chinese equivalent of voodoo in a murder attempt on Huji after a particularly flirtatious dance Ji’an but it is Yinniang who saves her. Similar methods were used to kill the previous lord and suspicions point to Jiaxin. Yet with Huji, Ji’an’s suspicion turns toward Lady Ji’an whose protection is her eldest son. The matter of the Imperial Court and its wavering influence over Weibo isn’t settled by the end of the movie and we leave the Weibo court as Ji’an listens to advisors who suggest distracting the Imperials troops with wine and food while trying to make an alliance with the Wang forces. If you’re wondering about the significance of the man shining the mirror, this is part of the legend of Nie Yinniang. In the end, she will marry a man who makes mirrors. She does so by telling her father this is her wish. Through her influence, her husband will get a minor office. Whether this is her husband (in the movie, the man already has a wife) or someone who will eventually introduce her to her future husband, we do not know. We do know that she finally has a friend and has chosen her own path. Yet we do not expect her to know the three Confucian obediences–to her father before marriage, to her husband after marriage and finally to her son after she is widowed. In “The Assassin,” the long intervals between intrigue and action, usually with awe-inspiring natural scenes (You could easily re-edit this to make a travel advertisement for the unspoiled China), emphasize the distance between places and the expanse that was and is China. Weibo is isolated and formidable and so is Yinniang on her journey toward finding herself and her true calling. “The Assassin” is full of human intrigue and asks us to sit back and forget our computers and the Internet which has brought us instant gratification and remember a time when things were slower and China was at the end of its glorious Tang Dynasty. In Mandarin Chinese with English subtitles. Previous Time for Stan Lee’s Comikaze!